For a gold star parent — someone with a son or daughter who died while serving in the U.S. Armed Forces — there is often a fear his or her child will be forgotten, according to Amy Moore. Amy and husband Patrick lost their son Benjamin in 2011 in Afghanistan, and the couple is working hard to ensure Ben is never forgotten. To keep his memory alive, the Moores, along with Rolling Thunder New Jersey Chapter 2, have a yearly Army SPC Benjamin Moore/Hope Hose Humane Fire Company 1 Memorial Scholarship Poker Run to help raise funds for scholarships at Ben’s alma mater, Bordentown Regional High School, and the Burlington County Emergency Services Training Center. This year’s poker run will be held at Shamong’s Pic-A-Lilli-Inn, 866 Route 206, on Aug. 6 from noon to 3 p.m.
“Our biggest fear is that our child will be forgotten. This event ensures that Ben will never be forgotten… Come out and support local firefighters and EMTs,” Amy said. The poker run is being held at the Pic-A-Lilli for the first time. Amy said it was chosen because of the Pic-A-Lilli’s “famous wings and biker friendly atmosphere.” For $20, attendees can enjoy all-you-can-eat wings, lemonade and ice tea as well as door prizes and vendors. All proceeds will go toward the scholarships. The poker run will work in one of two ways: riders of any vehicle can start off at the HHH Fire Company’s location in Bordentown and pick up their cards or go directly to the Pic-A-Lilli for their cards. The best hand by the end of the evening will receive $100. “They will have music, food and little things going on throughout the day,” Brian Maugeri, treasurer and EMT supervisor for HHH, said. Since he was young, Ben was passionate about giving back to the community. Amy said it took Ben a few tries going through the Burlington County Emergency Services Training Center, but at the age of 16 Ben was able to volunteer for the HHH Fire Company. “He liked to help others. He started at the fire house at 16 years old and you’d hear his beeper go off and him run down the steps in the middle of the night to go to a call,” Amy said. 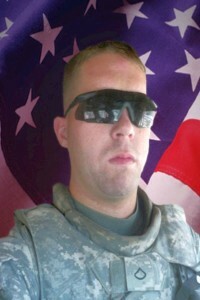 However, Ben wanted to do more and joined the military to serve his country. Unfortunately, his military service was cut short when he was killed in action. “He was doing what he wanted to do and was very passionate about it. His father and I take some comfort in that,” Amy said. 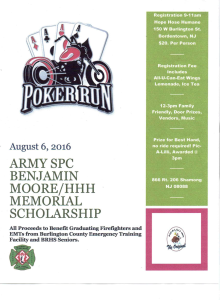 The Moores did not want Ben to be forgotten, and so in conjunction with HHH and Rolling Thunder New Jersey Chapter 2, they started the poker run and scholarship awards. The high school scholarship is given to a BRHS senior who is going into the service or interested in being a firefighter, EMT or police officer. The award for the Burlington County Emergency Services Training Center is given to a student who is most improved, and the award is given five times a year. “Ben always struggled in trying to accomplish his achievements. It took him a few times to graduate through EMT training. He worked really hard. I think it is pretty special we are awarding those men and women who work to improve themselves (like Ben),” Amy said. Since the inception of the poker run, the Moores have given more than $13,000 to brave men and women who volunteer their time in protecting their communities. “The award is just our way of saying ‘thank you’ to the recipient and their families for the sacrifice they have made in keeping us all safe. We owe these brave men and women a debt of gratitude. They have gone above and beyond by risking their lives on a daily bases for a $0 paycheck,” Amy said. To learn more about the event, visit www.patriotconnections.org/events/army-spc-benjamin- moorehhh-memorial-scholarship- poker-run/.